1Department of Biotechnology, Anna University, Chennai, Tamil Nadu, INDIA. 2Department of Biotechnology, Sathyabama University, Chennai, Tamil Nadu, INDIA. Angiogenesis is considered as an essential pathological feature of cancer due to its interplay between cancer and other diseases. Natural products found to act as antiangiogenic agents that mediate the angiogenic switch between pro and anti angiogenic factors. Among the different targets, HIF is an important and critical factor that stands as a key mediator between angiogenesis, inflammation and cancer. In our study different phytochemicals of Brassicaceae were analysed for their drug like properties and mapped for pharmacophore development. The developed pharmacophore was virtually screened and further subjected to Lipinski and ADMET filters. 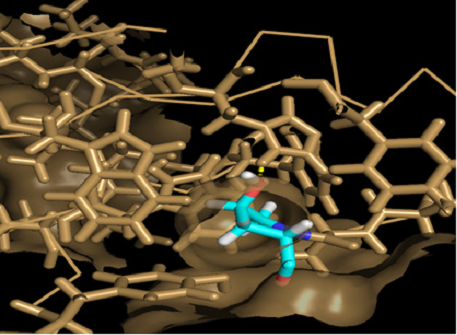 The molecular interaction studies of the 10 retrieved compounds were studied by binding with HIF. Among the compounds 1stdrug like molecule HTS 0115 (C15H21BrN2O3) was found to have best docked score and its interaction was further validated using dynamics simulation. The compound found to share the pharmacophoric features with progoitrin a biochemical form of glucosinolate with reported anticancer and anti thyroid activities. Thus the drug like compound HTS 0115 can be further optimised as a putative HIF inhibitor in tumor angiogenesis. Molecular dynamics simulation of HIF with HTS 0115 molecule. Renukadevi J, Nandhinidevi G, Bavanilatha M, Tharani H, Sathiyabama R, Vasumathi S. Pharmacophore Modelling of Brassicaceae Members as Potent HIF (Hypoxia Inducible Factor) Inhibitors Involved in Cancer Angiogenesis. Pharmacognosy Journal. 2018;10(4):798-802. Antibacterial Property and Molecular Docking Studies of Leaf Calli Phytochemicals of Bridelia scandens Wild.